Finding the Need for a Professional DJ Service on one of their Kauai Weddings, Maui'd Forever interviews and Hires DJ Jeff of Trax Entertainment. After interviewing many candidates we found DJ Jeff as the Best! Maui’d Forever is one of Hawaii’s few full service, all-Hawaiian Islands wedding planner and coordinator. Founded in 2003 by entrepreneur Mark Steffan, the company operates on the Hawaiian Islands of Oahu, Maui, Kauai and the Big Island of Hawaii. They use over 150 different wedding vendors and still find the need to add additional members to their team. They are happy to announce their newest member on the Island of Kauai, TRAX Entertainment DJ services. After interviewing many candidates for this important component of many wedding receptions, Maui’d Forever lead coordinator chose the services of DJ Jeff for their future DJ needs. Lisa tells us “Dj Jeff has the right combination of good prices and experience”. TRAX Entertainment was born in Beverly Hills, California in 1985 where founder Jeff Fishman made inroads into the music industry as director of one of America's top disc jockey organizations and began publishing TRAX Magazine. With a wide range of experience in event production from music concerts, talent shows, to recent films like The Descendants, Pirates of the Caribbean, Just Go With It, and Tropic Thunder, Jeff has experience in a variety of settings and is familiar with many aspects of entertainment. As a DJ, Jeff has been playing music and generating fun times for enthusiastic partygoers in a variety of settings. From clubs to mobile entertainment, Jeff is keen in "reading the room" and bringing guests together in the spirit of love and fun for possibly the most cherished occasion of one’s life. On Kauai since 1997, DJ Jeff now offers the best in wedding entertainment with a variety of options to enhance and create fun and beauty on your wedding day. TRAX will help create a special atmosphere for a wedding reception. From casual and laid back to highly energetic and interactive, Jeff can accommodate any need. His first gig with Maui’d Forever will be on April 5, 2013. 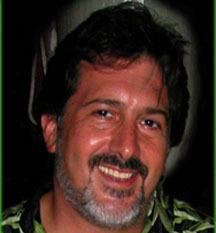 His DJ services are available in any of the Maui’d Forever destination Wedding Packages on the Island of Kauai.